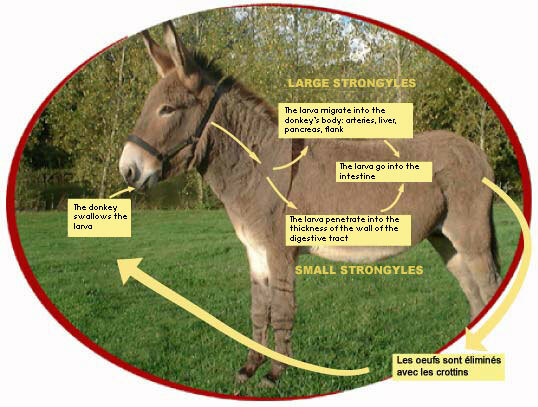 The strongyles are parasites often found in the horse and the donkey of all ages. There are many species, their are some which can be dangerous for the donkey. They measure 5 to 10mm in length, they are in more than 80% of equids and they are the parasite more frequentlt found. They measure 2 to 5cm in length. They are frequently in the large intestine and the larvae can often be the cause of severe various disorders. Among the three principal species (Stronglylus vulgaris, Strongylus edentatus, Strongylus equinus), the first is called "the horses killer" it is the most dangerous because its larva is responsible for the "verminous arteritis". When the climate is mild and wet, the strongyles' eggs which are in the meadows, develop into larvae and the donkey can then swallow them. The larvae penetrate in through the wall of the digestive tract. They can continue their growth to become adults, or to encyst during a few weeks or month's while waiting for better conditions. Once adult, the strongyles return to the intestine. When they arrive in the small intestine, these larvae cross through the intestinal wall, then will go slowly into the small arteries of the intestine, then into the large arterials trunks which irrigate the digestive tract. That can involve the formation of clots, then aneurisms. Larvae go through the blood way to go into the intestinal wall. When they return into the intestine, larvae are transformed into adults, and then lay thousands of eggs which will be eliminated in the faeces. When they are in the intestine, the clinical signs gradually appear with softened and malodorous faeces, diarrhoea, loss of appetite and fatigability. These strongyles parasites are found in all equids, but are especially dangerous for the young animals. They can cause in the winter and spring, various digestive disorders and constitute a factor which supporting the appearance colics. On top of the digestive symptom, the disorder occasioned by the strongyles' larva can be very variable: obstruction of the arteries, aneurisms, the effects touch the liver and pancreas, peritonitis, fever... In the most serious cases, we can see a brutal rupture of aneurisms and then death occurs by internal bleeding. Use active worming against the larval stage. It is advised to worm at the end of autumn (period of encystations) and at the beginning of spring when the cysts are transformed again into larva. To reduce the level of infestation of the pastures, we will use active worming against the adults in June and September. In total four annual wormings. It is advised to worm in the middle of spring or beginning of autumn when the climatic conditions are favourable for the strongyles growth. We will choose active products against the adults and especially for the larva which migrate.